Santa Clara, Utah — A dull but direct title. Every Independent Study advisor knows this critical point in the process: when your students have collected the data necessary to actually do their projects. With discovery-based science like ours on this expedition, you never know what incidents or vagaries in the field will occur before minimum data is acquired. We reached that point today for Galen and Ethan. The final three field days now are gravy! 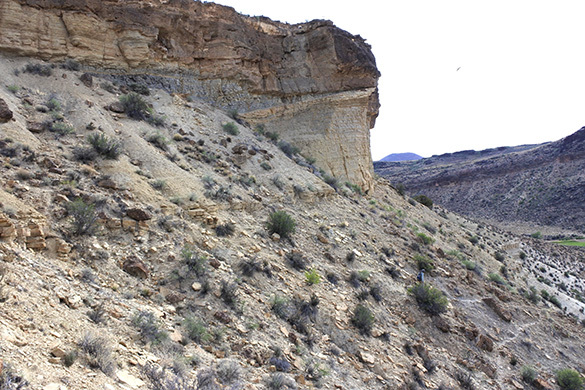 We started at a very familiar site: Eagle Mountain Ranch (EMR), its iconic cliff is shown above. (Thank you again, ranch owners Hyrum and Gail Smith.) 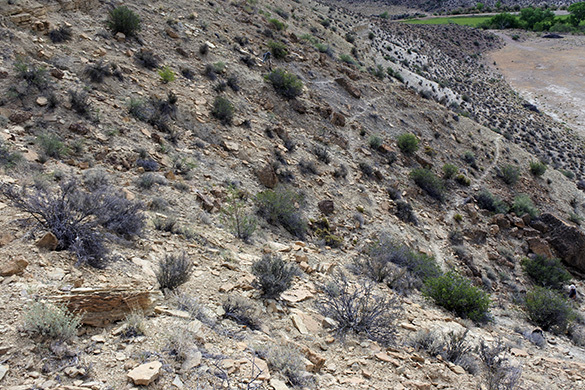 We collected here encrusted and bored bivalve shells from the Carmel Formation exposed on the steep slopes. Most shells had to be pounded out of the rock with hammers and chisels, so it was briefly a noisy place. We did very well, finding bryozoans, encrusting bivalves, sabellids, and a variety of borings, from what I could tell with my hand lens. The full glories of the specimens will be known after we wash them up and examine them with our lab microscopes. You may just be able to make out Galen in this view. 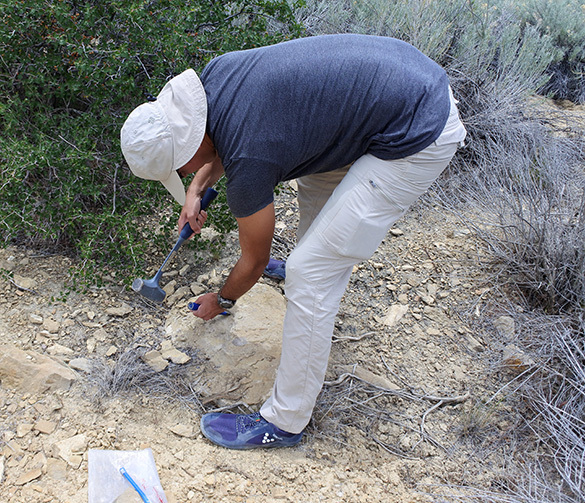 I’m used to standing for hours on steep hillsides bending over to pick up fossils, but it is getting harder! 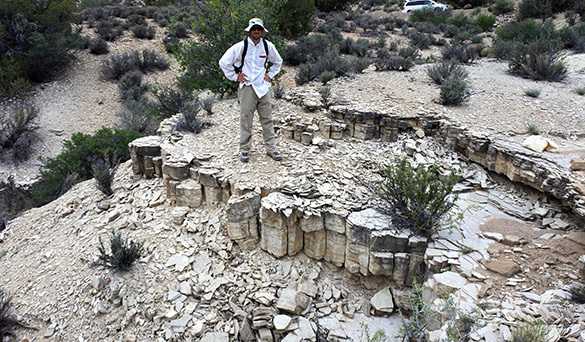 Below our fossiliferous units at the Eagle Mountain Ranch are thick “books” of thin-bedded carbonates with beautiful mudcracks. An effect of the repeated hexagonal cracks is that the unit itself develops columnar joints, analogous to those often seen in basalt flows. This is a sedimentary version. 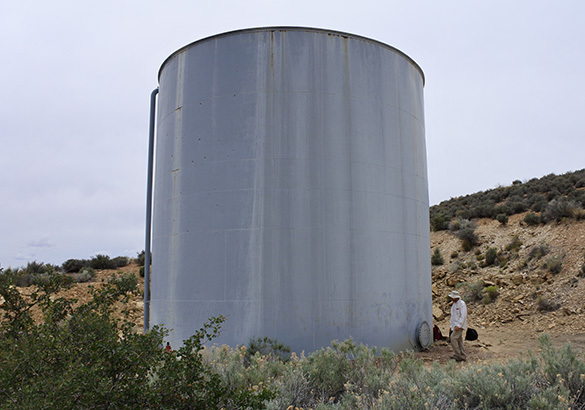 Our site at Diamond Valley is where a large water tank was erected, so we call it WT. 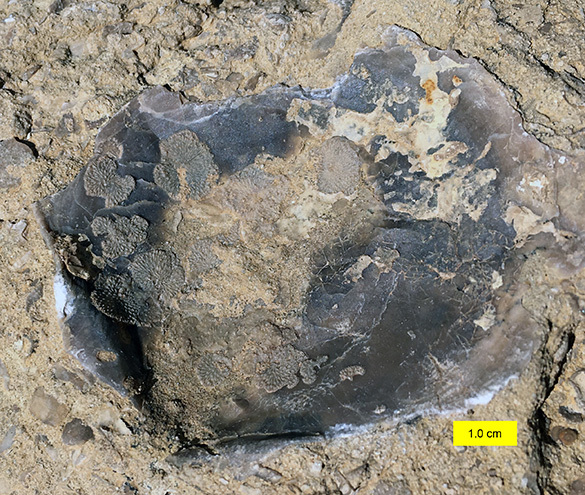 The excavation exposed a very fossiliferous layer of the Carmel Formation, and many of the calcitic shells are encrusted and bored. Like this bryozoan-rich bivalve I collected here last month. It is spectacular, especially considering how rare bryozoans are in the Jurassic of North America. Ethan manned the chisel today. Galen gathered specimens from the fossiliferous talus. 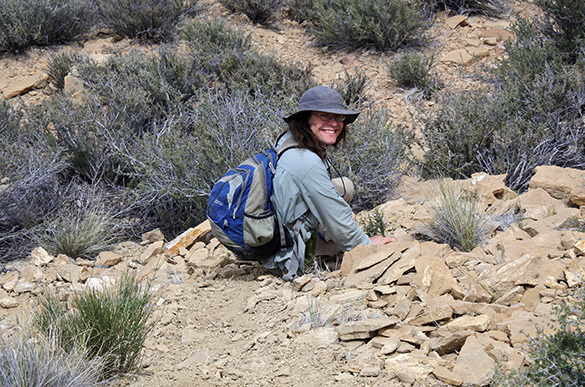 The team made several important finds, ensuring the happy Galen she’ll have plenty of sclerobiont fossils to analyze for the next year of research. Ethan finished his ostreolith collecting yesterday. Field success!